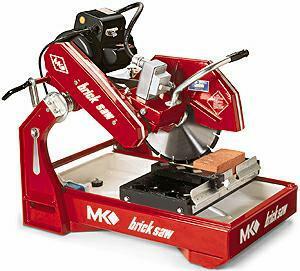 BRICK OR BLOCK SAW 14 INCH MK Rentals Ft. Collins CO, Where to Rent BRICK OR BLOCK SAW 14 INCH MK in Ft. Collins, Wellington, Greeley, LaPorte, Loveland, Windsor CO and all of Northern Colorado. Sliding tray, and the motor & blade can move up & down. Saw Stand, rolling tray, & one guide are included in the rental. Saw weight is 165 lbs Depth of cut is 5"
* Please call us for any questions on our brick or block saw 14 inch mk rentals in Fort Collins, Wellington, Greeley, LaPorte, Loveland, Windsor CO and all of Northern Colorado.